LEBANON — From the time I was a youngster, I'd heard the legend of Tony Vlastelica. As a 6-5 forward and sidekick to 7-3 center Swede Halbrook, Vlastelica was a member of the fabled 1954-55 Oregon State team that lost by one point to the Bill Russell-led San Francisco Dons, who would go on to win the NCAA championship. Halbrook was the star, but Vlastelica was an able second banana with a unique talent that has rarely been duplicated in basketball history. Vlastelica, who played for Oregon State from 1952-55 before playing professional ball for three years in Italy, took a hook shot with virtually every attempt from the field. His sweet spot was from the baseline in the corners of the court, where he would launch from 20 feet and beyond. Old-timers say it was a sight to behold. "Maybe 80 percent of my shots were hooks," says Vlastelica, now 88, retired and living in Lebanon with his wife of 17 years, JoAnne. "That was my shot. I never had a shot blocked, not even by Bill Russell. One guy said he blocked a shot of mine, but I don't remember it." Vlastelica was introduced to the hook shot during his sophomore year at Aberdeen (Washington) High. "I had a coach who told me, 'Get under the basket, I'll throw it to you, and you hook one up,'" he says. "I didn't even know what a hook shot was." Vlastelica tinkered with the hook through the rest of his sophomore season. "My junior year was when I really started to see what was going on," he says. "I started getting farther and farther away from the basket. I got where I could shoot them from anywhere. I don't know how that could happen. I still can't believe it." The range from which Vlastelica fired away with the hook was extraordinary, even during an era in which many post players were shooting hooks around the basket. "Tony had the best hook shot in the world," says Ron Robins, a starting guard on Vlastelica's OSU teams. "I don't know anybody who was better. He won a number of ballgames for us." Vlastelica came from hardscrabble beginnings. His father, George, came to Aberdeen from Yugoslavia with his family as a child in the early 1900s. Tony was the third-oldest of 10 children born to George — who pulled green chain in a sawmill for 30 years — and wife Mary. All 10 of their kids are still alive; Tony's oldest brother is 93. Tony was born in 1929, just as the Great Depression began. "We were the poorest of the poor," Tony recalls. "It was tough. I didn't go to school from seventh through ninth grade. Went to work to help the family survive. Worked at a Safeway and for my uncle, who was a fisherman during those hard times." Vlastelica returned for high school, primarily to play basketball. "I wasn't much of a student," he says. 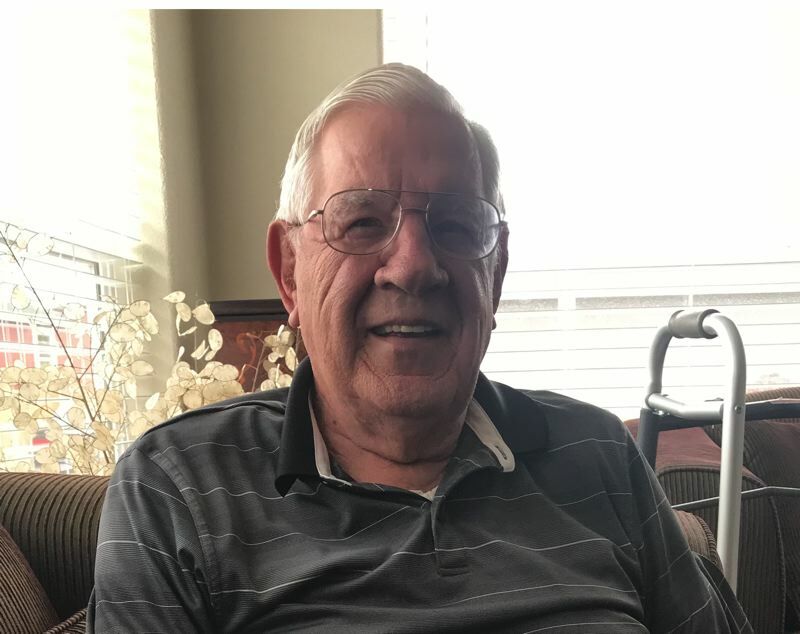 But he was a good enough basketball player to lead Aberdeen to the state championship game as a 21-year-old senior in 1950 — a veritable man among boys. After two years serving as a military policeman in the Marine Corps at Oceanside, California, Vlastelica was discharged from Camp Pendleton in January 1952. Tony had no money, but a doctor in Aberdeen paid him $1,500 to enroll at Grays Harbor Community College, he says. Once he joined the team, the Chokers went 18-0 and advanced to Hutchinson, Kansas, for the National Junior College Athletics Association Championships. Vlastelica had a 52-point game there. By this time, Vlastelica, 23, was a sought-after prospect by college programs throughout the country. Rules were different in those years, and Tony says he received overtures from a couple of NBA teams, St. Louis and Syracuse. "I told them I wanted to go to college," Vlastelica says. "I wanted to win two national championships, to be the leading scorer in the country and to be an All-American. I wound up with 73 scholarship offers." There was plenty of money being offered under the table by some of the schools, Vlastelica says. With the help of his "agent," Tony sifted through them, and was leaning toward Washington, which would reach the Final Four the next season behind coach Tippy Dye and All-American Bob Houbregs. "I planned to go to Washington," Vlastelica says. "I talked to Tippy. I don't know what the Huskies were offering me, but I know they were offering my father a job, too. But then my agent told me, 'We got a better deal with Oregon State.' I didn't care where I went. I only went because of the money." Vlastelica says seven businessmen pooled $30,000 to pay him $10,000 a year for three years to play for Oregon State coach Slats Gill — big money in those days. He offers five names of well-known Corvallis citizens of that era — names I recognize — as sponsors. Vlastelica also says he was given game tickets to sell for profit. He says he didn't think such payments were being dispersed to any of his teammates, even Halbrook. "I don't know if Swede got paid," Vlastelica says. "He borrowed money from me, so I guess he didn't." Nor does he believe such under-the-table deals were prevalent throughout the country in those years. "I'm sure others were getting something," Vlastelica says, "but I never heard about it." Robins says he wasn't receiving extra money and wasn't aware Vlastelica was benefitting from a slush fund. "Years later, Tony told me about it," says Robins, now retired and living in Meridian, Idaho. "I have a tendency to believe it, but back then, I didn't know anything about it. There were indications from Slats that led us to believe somebody got a few bucks, but not anything like that." Vlastelica says 90 percent of the money went to his parents in Aberdeen, though he did make one major purchase during his time at Oregon State — a 1952 Chevrolet Bel Air two-door hard-top. "It was a beautiful car," he says. "I parked it right in front of the (Kappa Sigma) fraternity. A kid used to wash it for me." That would seem to be a tip-off that a poor college kid was getting extra benefits. Was Vlastelica surprised he never got caught? "How would anybody know about it?" he asks. "I never told anybody, and I don't think anybody else (who was involved) did, either." What about Gill? Certainly, he must have been aware of the payments. "I don't know if he knew or not," Vlastelica says. "I sometimes think he figured I had more money than he did. He must have known. He knew all those people. I had the car. I wore a diamond ring. I had beautiful clothes." Vlastelica did get caught in another situation, though, that put him in hot water with the coach. "A lady's husband was paying me $500 a month for a few months," he says. "She delivered it in her Cadillac — five $100 bills. We got caught having an affair. She wanted to get married, but I came there to play basketball." News trickled to assistant coach Paul Valenti, who told Gill, who called Vlastelica into his office. "I denied it, which was a mistake, just like doing it in the first place," he says. "I should have said, 'I did it. I won't do it again.'" Vlastelica ended the affair, but found himself in Gill's doghouse. He also hurt himself with an incident early in his junior season. After being yanked early from a game, Vlastelica was summoned by Gill to re-enter. "Go in yourself," Vlastelica told the coach. "You'll pay for this," Gill responded. "I paid a penalty," he says, "because I played only half the time my last two years. I wasn't an attitude problem. I just had that one thing. I never missed a practice. I was right on time. I did what he said to do. Slats must not have been smart enough to know he was hurting the whole team by not playing me more." As a sophomore in 1952-53, Vlastelica was the leading scorer (at 13.1 points per game) on an OSU squad that struggled to an 11-18 record. Then on came Halbrook, the giant out of Lincoln High, and the Beavers' fortunes took a dramatic turn. In 1953-54, with Halbrook averaging 21.2 points and 11.9 rebounds, Oregon State went 19-10 overall and won the Pacific Coast Conference's Northern Division with an 11-5 record. The next season, the Beavers were 22-8 and ran through the PCC North with a 15-1 mark. Halbrook, who joined the team late because of academic deficiencies, averaged 20.7 points and 14.1 rebounds in 19 games. Vlastelica, meanwhile, was second on the team in scoring both seasons, averaging 8.2 points as a junior and 11.5 points as a senior. Though considered an excellent marksman, he shot .351 from the field as a junior and .372 as a senior — par for the course in that era. During the 1954-55 season, the Beavers shot .376 as a team. Halbrook was as unique as Vlastelica because of his size — the tallest player in the country — and physical prowess. He was athletic and had good hands. "Swede could rebound and he could score," Vlastelica says. "In one game, he got 35 points and 35 rebounds. Nobody could match up with him." But Halbrook wasn't a hard worker, wasn't very responsible and made little connection with his teammates. During the 1954-55 season, after he returned from academic suspension, Gill briefly suspended him for misconduct before reinstating him. "Sometimes we didn't practice because he didn't practice, and we didn't want the press to know something was wrong," Vlastelica says. "He just didn't care. Off the court, he got involved with the wrong crowd. He was quite a wild man." Says Robins: "Swede disappeared after practice, and he disappeared after games. I never really knew him. I didn't know of anybody who knew him. He was a loner. He went his own way." When Halbrook played, though, he was effective and often times dominant. In the Elite Eight game against USF in Corvallis in 1955, he battled the 6-10, 215-pound Russell tooth and nail. Russell collected 29 points and 16 rebounds while Halbrook had 18 points and 18 boards in the Dons' 57-56 victory. Robins' shot from the corner in the closing seconds could have won it. "The ball bounced high off the rim, and I swear somebody opened the door in Gill Coliseum and the wind blew it out," Robins says 63 years later. Vlastelica, meanwhile, laments his personal situation. "I was on the bench for 12 minutes in that game," says Vlastelica, who scored 12 points against USF. "We lost by one point. Russell said to me afterward, 'We were lucky to win.' They were." 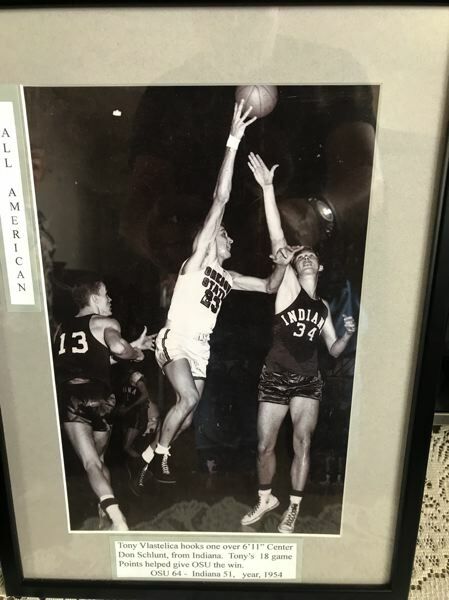 Halbrook went on to play five seasons with the Wichita Vickers in the late 1950s during an era when AAU basketball was considered almost on par with the NBA. He helped the Vickers win the 1959 national AAU championship. He then played two NBA seasons with the Syracuse Nationals from 1960-62, averaging 5.5 points and 6.6 rebounds as the tallest player in league history at the time. Halbrook died at age 55 in 1988. There were plenty of players in Vlastelica's era who shot the hook shot, but few, if any, at his range. "Houbregs was the only guy," he says, "but he didn't shoot them like I did. I shot them from the baseline mostly, and I never once hit a backboard. I bet I shot 10,000 hook shots. I'd shoot them all the time. I had an underhanded left-handed scoop shot. I'd fake the hook and go left. I had a right- and left-handed hook shot. I'd shoot the left once and I'd make it, but I'd never shoot two. I'd shoot (right-handed hooks) from as far as 30 feet away." As was the style with many in the '50s, Oregon State's players all shot free throws with the underhand style. "Guys used to ask, 'Why don't you shoot hooks on free throws?'" Vlastelica says. "I'd have been on the bench for a month if I did that. I could have shot 90 percent, but everybody shot them underhanded under Slats." Many big men have employed the hook shot through the years, notably former Oregon State and Trail Blazers center Steve Johnson and Hall of Famer Kareem Abdul-Jabbar. "But they didn't shoot it as far out as I did," Vlastelica says. The advent of the jump hook came in the late '80s, from players such as ex-Blazer center Kevin Duckworth. "That's not a hook shot, what Duckworth and those guys were doing," Vlastelica scoffs. "They're shooting them off the wrong foot." Vlastelica had issues with Gill during his time at Oregon State, and he retains ill feelings more than 60 years later. The Beavers averaged 59.0 points in 1952-53, 61.6 points in 1953-54 and 60.9 points in 1954-55. Even in that lower-scoring era, Vlastelica considers it a travesty. "If Slats would have just let us play basketball, we'd have won it all my senior year," he says. "I know we could have won a championship. He should not have been our coach. His coaching style was outdated. He was happy to win with scores in the 50s. With Swede and I, we should have averaged in the 70s and 80s. He was a coach from the '40s, when they still had the jump ball after every basket (That rule was actually eliminated in 1937)." After winning the PCC North title in 1954-55, Oregon State played PCC South champion UCLA in a best-of-three series for the conference title. The Bruins, coached by John Wooden, were ranked ninth in the country. Before the series, Gill had a talk with Vlastelica. "He said, 'We can't beat (the Bruins). They score too many points,'" Vlastelica says. "I told him, 'If they score 80, we're gonna get 90.' And we could have. They couldn't stop Swede. And no one could make a basket against us, because Swede would bat it away." Oregon State won the first two games by scores of 82-75 and 83-64 to advance to the NCAA tournament. "Those were the only time in my three years that we scored 80 points," Vlastelica says. "Years later, (UCLA's) Willie Naulls told me, 'Tony, you guys had the best team. You should have won it all.'" The Beavers topped 80 points in three other games during Vlastelica's final two seasons. But low scores were the norm. "I get so angry when I think about what we could have done," Tony says. "I'll never understand Slats. He didn't have the imagination. I'll tell 100 people that. If I could have transferred without penalty, I would have. I should have been starting all the time. No one could do what I could do. I could score on anybody. Nobody could stop me. "We had the personnel to win a national championship, but he did not use them the way they should have been used." Even without studying much, Vlastelica got his degree in science education. He was chosen by Rochester in the 13th round of the 1955 NBA draft, "but I never even talked to them," he says. "I don't know why." Instead, Vlastelica played professional ball in Italy for three years, making $10,000 per season. "Because of my name," he says with a laugh, "they thought I was Italian. They wanted me to play with Italy in the 1960 Olympics." A back injury caused Vlastelica to retire in 1959 at age 30. He returned to Corvallis and worked in the investment business, married and had a daughter. He spent a year living in Santa Barbara, California, then moved to Boise in 1972 to open two Baskin-Robbins franchises. Vlastelica returned to Corvallis in 1981, worked for the city for a while and then opened an ice cream shop and began distributing ice cream to fairs. After his first wife died, Tony married JoAnne in 2001. He retired from the ice cream business just three years ago. Recent years have taken their toll on Vlastelica's body. He has had six surgeries over the past decade, including a recent one to repair a heart valve and carotid artery. "But I'm all right now," he says. "I feel great. I use a cane, but otherwise I'm in great health." Vlastelica doesn't hold a grudge against Oregon State. He follows Beaver teams and roots for them fervently. He'd love to further the cause of the shot that made him relatively famous. "I wish coaches would ask me to show kids how to hook shoot," he says. "I'd be willing to do that. It takes time and it takes work, but it's effective. It's a shot no one can guard."